September real estate in Coronado followed national trends last month as it slowed down. While we’re down from the strong summer months’ numbers, the market is nowhere near hibernation. 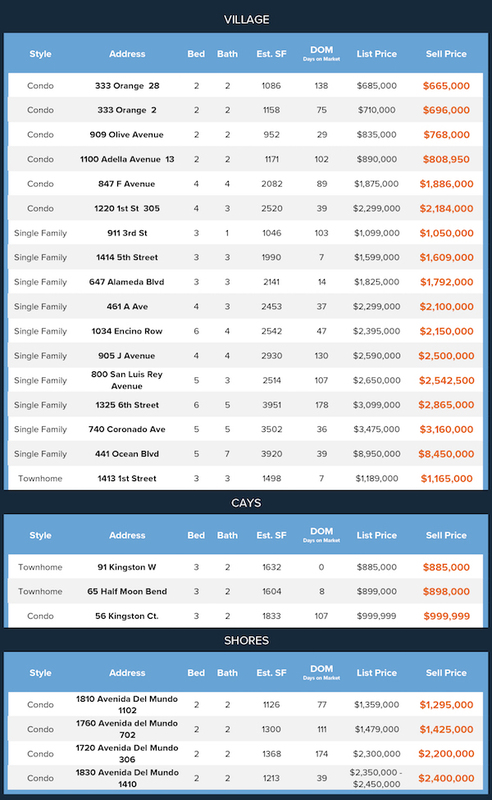 The fall month saw 24 homes close, a strong showing for an off market in a community our size. The Village came through as the powerhouse with 17 residences closing. Of the total, six were condos, one was a townhome and a whopping 10 were single-family homes. Condo prices ranged from $665k to $808k. The townhome sold for $1.1 million and the single-family residences ranged from $1 million to $8.9 million. The Cays and Shores came in close in volume of homes moving last month. Two townhomes and one condo closed in the Cays, with four condos closing in the Shores. Prices in the Cays ranged between $885k and $999k. The condos in the Shores varied between $1.2 million and $2.4 million. Give us a call at ParkLife Real Estate today to make your Coronado dreams a reality. Each month we work with families on both sides of the aisle. From identifying the best price point to list your home at to creating a strategy to buy in a competitive market, we are the go to experts for the Coronado market.